I have travelled to Greece by book, and I have been on a grand adventure with a lovely heroine, to celebrate Mary Stewart Reading Week. The story began with a young woman, Camilla Haven, sitting outside a café in Athens, writing a letter to a friend. She had come on holiday alone, after parting company with her fiancé and after the friend who was going to accompany her had an accident, and though she was proud of herself for striking out alone she was a little bored. “Nothing ever happens to me,” she wrote. But something was about to happen. Of course it was! In an extraordinary case of mistaken identity Camilla found herself in possession of keys to a car to be delivered to “Monsieur Simon” in Delphi. It was, the deliverer of the keys told her before beating a rapid retreat, “a matter of life and death.” Camilla had no idea where to return the keys, she was intriguded, she was concerned, and she had planned to visit Delphi; and so she decided that she would deliver the car. The narrow twisting roads, and the local drivers, weren’t at all what she was used to, and along the way she found herself needing to be rescued. She was saved by an English schoolteacher. A man named Simon. He knew nothing about the hire car, and he didn’t think he was the man Camilla was looking for, but he was travelling to Delphi too, and so they joined forces. And they got on very well. Simon had come to Greece to find out more about his brother, Michael, who had worked for the British intelligence service during the war had been posted to Greece to help local resistance groups during the German occupation. Michael had died in Greece, and fourteen years later, when his father died, Simon found Michael’s last letter home. And he realised that the tone of the letter and the story that he had been told about his brother’s death didn’t match. He had come to Greece to find out, to try to reconcile the two. And that, of course, was the beginning of a wonderful mystery, that was all the more wonderful because it was so firmly rooted in the war, in Greek history and culture. It took a little time for the story to capture me. At first it seemed a little too “typically Mary Stewart”, the car trip went on just a little too long, and I didn’t like the crisis that brought Camilla and Simon together perpetuated the stereotype that women drivers can’t reverse. But I liked Camilla from the start, and it was lovely to watch her finding her feet and gaining in confidence as she coped with all kinds of things. And I liked Simon, who treated her with courtesy and respect, and whose faith in her was wonderful. Their dialogues were lovely, they read so naturally, and I enjoyed watching their relationship grow. That relationship might have been a nicely understated romance, or it might have been a firm new friendship between two people who had a space in their life that needed filling. I was so pleased that, even at the end, Mary Stewart didn’t offer a definitive answer to that particular question. The plot built, slowly and steadily to a dramatic ending. It balanced a natural progression with some unexpected developments so very well. And in the final pages the evil of the villain and the perilous situation that Camilla found herself in were horribly, horribly real. My heart was in my mouth. I’m sure I could pick out little faults if I wanted to. Contrivances, coincidences, that kind of thing. But I don’t want to, because when the story caught me I stayed caught – hook, line and sinker – to the very end. Mary Stewart does what she does very, very well in this book. I don’t particularly like the description “romantic suspense, ” but it does fit, and I can’t think of a better one. I think this might be my favourite of her books that I’ve read, and now I am eager to read the two other novels she set in Greece. I read this a few months ago and was equally impressed. I really love how she incorporates ancient history into this novel and the discovery they make in the cave is just magical. 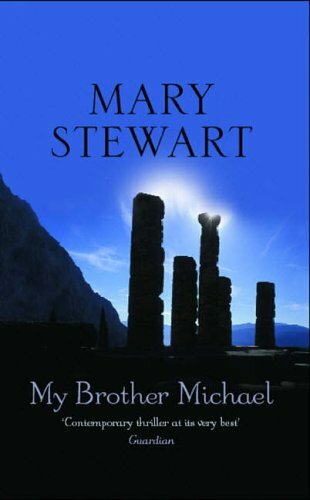 You can tell that Stewart admires Greece and is fascinated by its history – this shines through in My Brother Michael. Thank you for reading along this week. I’m glad you read something that you enjoyed. This is an excellent review, and a Mary Stewart I haven’t read yet! 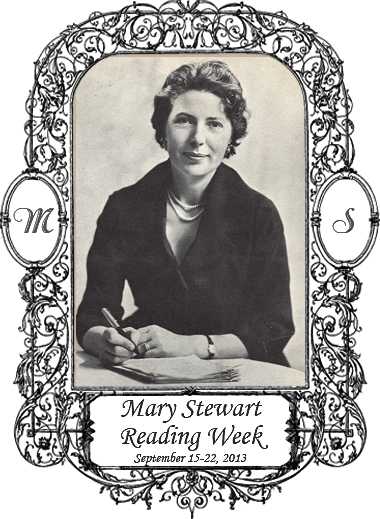 And I forgot all about Mary Stewart Reading Week too…oh well. The only Mary Stewart I ever read was the Merlin Trilogy (as it was when I was a teenager – I believe it’s five books now). But this lovely review really makes me want to read some of her other works – off to the library or the charity shops for me! You capture the appeal of this so well! I really loved this one for its blend of layers of history from ancient to modern. And the setting was captured so well. I recommend The Moonspinners for more lovely Greek atmosphere (and also This Rough Magic, though that was a bit more ‘fantastic’ in storyline). I haven’t read this one yet, but the other two set in Greece (This Rough Magic and The Moonspinners) are two of my favourites. Her settings are always wonderful but the Greek ones are particularly vivid and beautiful. I have only had the chance to read one Mary Stewart book for this week. But I know I am going to have to read more of her work. Library here I come. Over the years I’ve read and re-read the first three Merlin books (bought back in the days when it was only a trilogy), and I remember reading Touch Not the Cat when I was a teenager, but I’ve recently acquired Thornyhold (on my Mother’s recommendation) and This Rough Magic, but haven’t read them yet! This sounds particularly good. I really like what you’ve said, that the relationship isn’t determined either way, letting the reader work it out for themselves almost. She does it so well, doesn’t she? I always end up liking her characters enormously. Thornyhold is my favourite, but I really must re-read the Merlin trilogy which I thought was wonderful.